Volume always precedes price. Supply and Demand in forex is best defined by trade volumes and trends are formed by supply and demand. Thus if you want to see the move before it happens, take your eyes from the price and look at the volume. 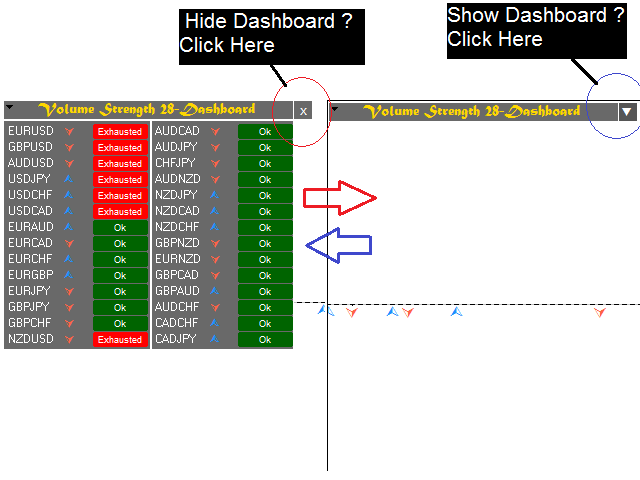 Volume Strength 28 is a currency meter that is different from any you’ve come across. Typical currency meters found in the forex markets/community uses price as bases of their analysis however this currency meter uses volume as the bases of its analysis. Volume strength 28 analyses the trade volume of 28 currency pairs and defines the strength of a currency based on volume. With this logic you can easily spot both micro and macro moves in a currency pair even before they happen. There are many applications of the Volume Strength 28 but we are just going to highlight a few we have been able to define with success. I encourage every user of this product not just to focus on these few applications but to study and discover it more because we are still yet to exhaust its applications. Spot strong / weak currencies. Spot trends at its earliest stage. Know the stage of trend and the best time to enter trades. Spot the end of a trend. Spot reversals at its early stage. Spot pull backs at its earliest stage. Multi-Currency Dashboard: It has multi-currency dashboard for display of trend direction and trend stage for 28 currency pairs. Trade Zone Lines: It has trade zone lines to define the stage of the trend. Green Zone is the tradable zone, Yellow Zone is the exhaustion zone /no trade zone and the Red Zone is the exit zone. Notification/ Alert: The indicator has pop up notification, email notification and push notification for trend change and trade zones. Make sure all data are loaded to get correct strength values. Incomplete data will be displayed on the screen. Incomplete might return wrong strength values thus they should be updated. The green zone is the recommended zone for trades, the zone is between -1.0(100% on the negative region) to 0.49 (49% on the positive region). From a series of test done, we discovered most trades outside this region ends in loss because reversal /pull backs are imminent outside this region. The yellow zone represents the beginning of trend exhaustion, the zone is between 0.5 (50 %) to 0.69 (69%). At this region it recommended to stop trading and look for exits. This zone represents where the trend is exhausted. It depicts the overbought/oversold conditions of each pair. A move below this level from the top represents a trend reversal/pullback and this should be an exit point. 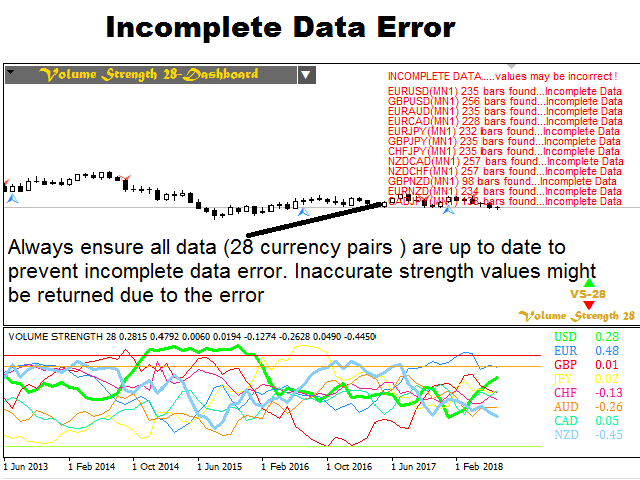 Data Error: To get the correct volume strength values, it is compulsory that all 28 currency pair data must up to date. Show Exit Arrows: Enable / Disable Exit arrow display. This is a good product. I have been using it and it helps me decide the right direction of price action. Based on the request of customers we have added a new feature to the indicator. In the new version you can enable / disable display of currency values on the indicator window. Just enable/disable "Display Currency Value " on the input menu to use this option. This will enable for an option to have a clean and uncluttered chart. We have fixed the bug with the notification system. The Yellow Zone Alert and The Trend Exit Alert gives recurring alerts on some occasions. This issue has been fixed. We have also re-enabled the trend arrows. We have updated the chart trend arrows to show the exit signals only for clarity . Exit previous trend on exit signal.